Photo by Anthony Westkamper The mouth of the beastie. Photo by Anthony Westkamper A honeybee and a wanna-be. Recently out in the yard, a glimpse of the insect world's most popular warning colors of black and yellow hinted that the buzzing around me might be a bumblebee. I was eager to get a good picture to send into the Bumblebee Watch Project. Noting declining bumblebee populations, it requests anyone with a camera take photos and submit them so the organization can track populations and locations of various species of bumblebees. When the insect finally landed, I got my photo. When I downloaded it to my computer I was surprised to see that it was not a bumblebee all, but a 'Syrphid fly.' This is a member of the family of hover flies, many of which are noted for their resemblance to bees and wasps. They exhibit classic Batesian mimicry, wherein one species gains some benefit by resembling another more dangerous one. In this case, the innocuous hover flies almost always resemble something that can sting. They usually live off of flower nectar and in the process provide pollination services to the flowers much like the bees they imitate. There are syrphid fly species which emulate honeybees, bumblebees and yellow jackets extremely well. After all, their lives really do depend on it. Interestingly enough, today when I was again buzzed by something I found it was actually a bumblebee. 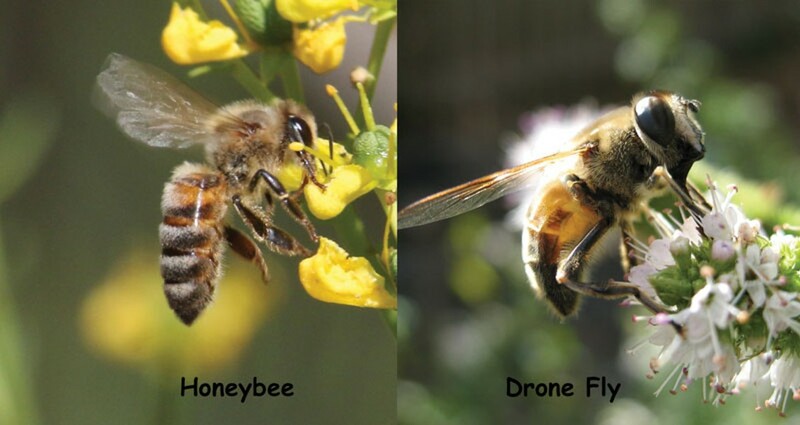 So, the fly not only copies the bee's protective coloring, but its annoying flight habit as well. And they say liars never prosper. I am not a person who says, "There is room for every living thing in my world." Nope, I hate ticks. They're vectors for illnesses like lyme disease, Rocky Mountain spotted fever, and a new one from Kentucky: Bourbon virus (named for the county where it was first discovered, not the liquor). And they give bugs a bad name. They are more closely related to spiders than insects, closer still to mites. If get a tick attached to you or your pet, don't squeeze or kill the tick while it's attached. You don't want to cause the critter to disgorge the contents of its gut into you, which squeezing, prodding and coating with Vaseline or heating with a match head can do. Regurgitated tick juice will certainly contain alien proteins that can cause allergic reactions, and the juice may contain disease organisms. Want to know why they're so difficult to remove? Look at the tick's head. That beak is designed drive in and hold on like a barbed fishhook. Pulling on the body usually just breaks the head off, leaving the mouth embedded in the wound. So what can you do? According to the Centers for Disease Control, the best thing to do is use narrow tweezers, grasp it as close to your skin as possible and pull it out. From Down Under, where ticks may be an even bigger problem than hereabouts, the Australasian Society of Clinical Immunology and Allergy suggests freezing them with an aerosol starting fluid, like you use to start a recalcitrant lawn mower, to freeze the critter before removal. Although this method is not sanctioned for human use in the US, there is a product for use on pets. If you wish to keep the tick to show medical professionals or your close friends, I suggest sealing it between two layers of clear plastic tape. It makes for easy handling, seals in all potential disease organisms, and leaves the specimen easily examined through the tape. I do not bother killing them first, because I really don't care.